In the early days it was always a drawn out affair to tie all the gear on the bike. Although I had the saddle bags all the other gear seemed to be tied on here and there. There was no organised system. Going away camping on the bike needed to be a bit more organised and easier. So I came up with an idea that solved this problem. Below is a guide on how the plan came together that made motorbike camping an easier trip away. When designing the Cruiser Rack I was looking for a way that incorporated the structure of the bike itself, including the saddle bags. 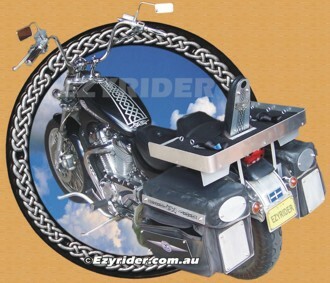 The rack also needed to sit as low as possible, still enabling access to the saddle bags, and carry all the equipment. I cut a cardboard template that fitted around the edges of the rear seat, around the rear side and sissy bar and over the top of the rear light. The idea was to carry sleeping bag, chairs, mattress etc behind the sissy bar, leaving the front area for the tent and other things. And the finished product looks like this .... with details of the build below. The under view of the Cruiser Rack. The front is at the bottom of pic. near (E) The base of the rack was cut out of 50mm cedar. Mainly because of it is light and thick, easy to screw to. I painted it black. 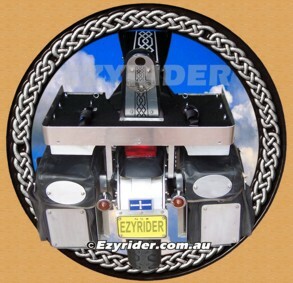 Note the area around (I) and (H) where the cedar is cut to fit around the back rear seat and sissy bar. (A) Is a piece of old car carpet I had lying around for years. The cedar was positioned on the bike first and a piece of template cardboard cut, to try and get the right size and fit for the carpet. 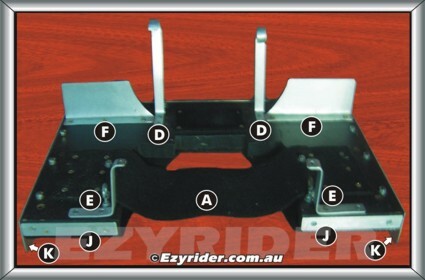 This is used for the correct front end height as the (C) area sits on the rear tail light. Carpet is screwed to the cedar at (B) (C) Is 2 pieces of carpet to give some sponge resistence on the rear light. 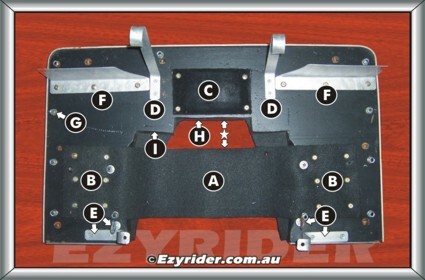 (F) Are aluminium plates cut to shape and bent to shape as a back stop to gear placed on top of the saddle bags. There was a big gap at the rear end from the saddle bag top to the underneath of the cruiser rack. 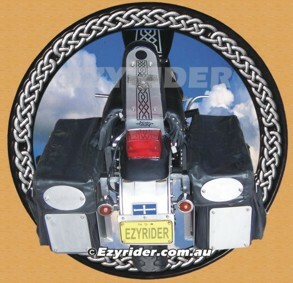 You could also attach extra rear lights or reflectors. (G) Are the nuts and thread of the eye bolts that go directly through the cedar. The eyes are used thread straps for equipment tie down. (H) (I) and the (*) shows how this area fits around the sissy bar. 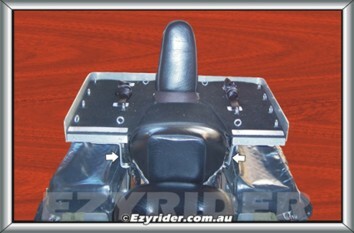 The carpet sits tight up against the sissy bar to reduce any movement to the rear. Although, as other pictures show, there are other safeguards also. A view of the cruiser rack showing the shape of the carpet that sits and wraps around on top of the rear seat. The (D) aluminium strips are different lengths because my measurement weren't spot on when attaching the saddle bag supports. (E) Shows a better view, with a drilled hole in the top area where it is bolted to a bracket attached the the bike frame. (J) Are pieces of alluminium strip screwed to the edge of the cedar for edge protection. (K) Shows the side and back edging on the cedar. Can be seen better in other pictures. 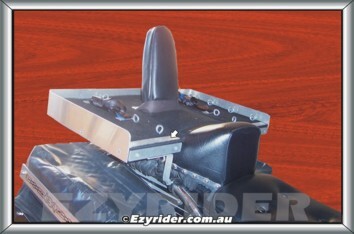 This rear view shows how the aluminium strips at (D) wrap around the spacer supports used to construct the saddle bag supports. 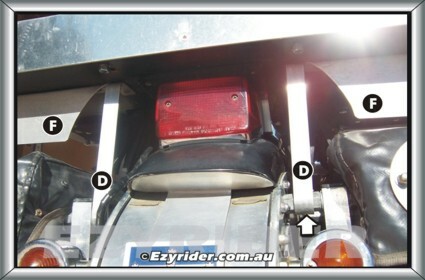 Withe (F) appearing as a visual blockage between the saddle bag top and cruiser rack. (D) Supports are just hooked in. When the cruiser rack is unbolted from the front, it can be tipped up leaving room to slide (D) supports off. Enough room was left for the tail light to be easily seen, yet an area big enough for the equipment - sitting on top of the tail light. Shows how (E) is attached by bolt to a wrap around bracket on the bike frame. This was obtained from the local industrial replacement shop. 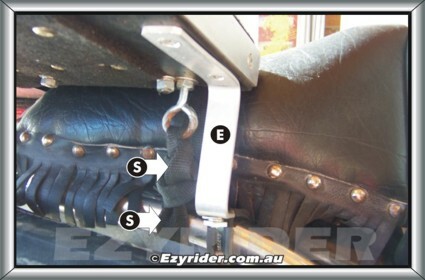 (S) Shows the eye bolt with straping tied to it, wrapped arount the frame, then up and over the seat to the other sit. This is just another precaution if (E) gives way and also offers reduced movement sideways. The rear seat is not standard. It's a seat obtained from the wreckers, turned around the wrong way and attached to the rear guard. The leather strips on the side were cut to give a fringed effect and studded to the side of the seat. There was a bit gap when the seat was fitted and this closed it up. (Y) Shows another piece of aluminium strip where the Cambuckle tie downs are attached to the surface of the cruiser rack. Opened up they are used to wrap around and tie down equipment. There is another at the other side. Near section (A) can be seen the surface carpet on the cruiser rack. Cut to fit around everything including the rear seat. On the left hand side of (X) can be seen the lip that sits above the cedar base and gives some resistence to 'sliding' equipment. Looking from the front shows the floor area for tying down equipment, with the eye bolts in place for running tie downs through. The right hand picture shows the passenger seat, turned around to give a front lift. This has been good also for holding equipment to the rear. No slippage to the front. 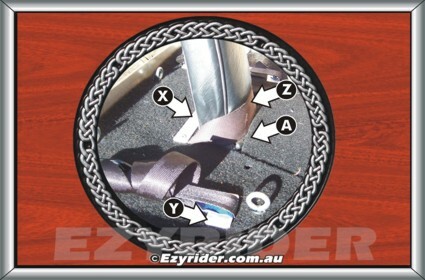 The arrow indicates a strip of aluminium to hold down the edge of the surface carpet. The complete unit is a reasonably tidy affair that sits and looks to some extent part of the bike. But mainly it is now a lot easier to tie down equipment. It takes 5-10 minutes to attach and de-attach it - Two bolts, two screws and one tie down. And for a bike that is 30 years old, it sits well.